"I shall find a way, or make one." 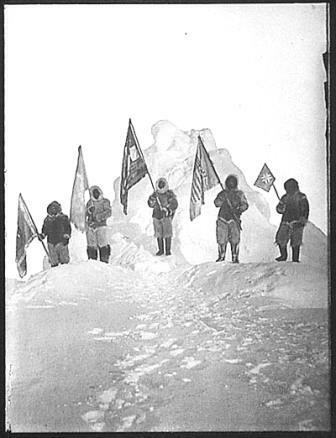 The DKE Flag on the North Pole. holds the flag of the Red Cross. ROBERT PEARY is unique among Deke alumni. The fraternity claims five U.S. Presidents. It claims governors and legislators. It claims Hollywood actors, business tycoons, authors, and it claims leaders in all segments of society. The difference between Peary, our brother from Theta at Bowdoin, and most of those men is that HE CLAIMED DKE. Twenty-three years after graduating from Bowdoin and leaving Theta, DKE's second chapter, Peary kept DKE foremost in his thoughts. He proved it 98 years ago this week when he discovered the North Pole and planted five flags there. Among them was our Rampant Lion on a field of crimson, azure and or. Brother Peary considered his DKE flag essential. It was with him as he enjoyed his success at the top of the earth, providing perhaps the greatest example in all of our brotherhood of what it means to remain an active Deke after leaving the Halls of DKE. At the turn of the last century, the idea of a man reaching the North Pole was a very big deal. It was so big that some 756 men had died trying to get there. Then along came Peary, a civil engineer with a burning desire to secure a place in the history of exploration by being the first man to stand where there is no east or west. 98 years ago this week. April 6: On the trail again before midnight though I gave the party more sleep at this camp than at the previous ones, as we were all needing it, but I wanted to make the next camp in time for a noon sight if the sun was visible. Weather thick, like the march after Marvin turned back. A dense lifeless pall of gray overhead, almost black at the horizon, & the ice ghastly chalky white with no relief. Like the ice cap, & just the thing an artist would paint for a Polar Icescape. Striking contrast to the glittering sunlit fields over which we have been traveling for 4 days...The going better than ever, hardly any snow on the hard granular surface of the old floes, the blue lakes larger. The rise in the temp to -15˚ has reduced friction of the sledges 25% & gives the dogs appearance of having caught the spirits of the party. The more sprightly ones as they trot along with tightly curved tails, repeatedly toss their heads with short barks & yelps. 12 hours on a direct course. (30 miles) Can I wait to cover those other 5? The wind which was from the east when we started gradually veered to the south & died away. While we were in camp it blew fresh from the east for some hours. Robert Edwin Peary was born May 6, 1856, 12 years after Phi of DKE was founded at Yale. Fifty-three years later, on April 6, 1909, he was the first man on the planet to reach the geographic North Pole of the earth. Peary was born in the Pittsburgh-area town of Cresson, Penn. He moved to Maine, attended Portland High School, then matriculated at Bowdoin College. At Bowdoin, Peary pledged DKE. He participated in many activities -- rowing for his class crew, organizing Ivy Day activities, and composing the class ode. He also pursued interests including taxidermy and the outdoors. He graduated Phi Beta Kappa in 1877 with a degree in civil engineering, and four years later he was commissioned a Lieutenant in the U.S. Navy. Peary made several expeditions to the Arctic, exploring Greenland by dog sled in 1886 and 1891 and returning to the island three times in the 1890s. 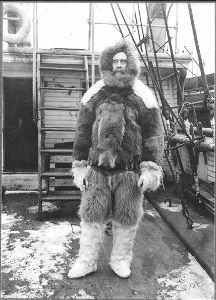 Unlike many previous explorers, Peary studied Inuit survival techniques, built igloos, and dressed in practical furs in the native fashion. 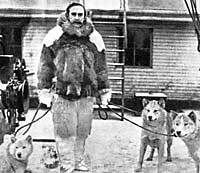 He also relied on the Inuit as hunters and dog-drivers on his expeditions, and he pioneered the use of what he called the "Peary system" of using support teams and supply caches for Arctic travel. He had eight toes amputated but kept walking. His wife, Josephine, whom he married in 1888, accompanied him on several of his expeditions, giving birth in the arctic to one of their two children, a daughter, Marie Ahnighito Peary. In 1893, Josephine published her experiences in My Arctic Journal. Peary made several attempts to reach the North Pole between 1898 and 1905. For his final assault on the pole, he and 23 men set off from New York City aboard the Roosevelt, named for then-U.S. President Theodore Roosevelt, a Deke from the Alpha chapter at Harvard. Roosevelt was a freshman at Harvard in 1877, when Peary was a senior in the Deke chapter at Bowdoin. Peary had tremendous determination, unending drive and faith that he could reach the North Pole. His will was so strong that he forced himself to march on even when he was in great pain from his feet, the toes of which had frozen and been amputated in 1898. Despite this he hiked 1,000 miles around the northern tip of Greenland mapping unknown territory. From Cape Sheridan on Ellesmere Island, the team that was to finally see success in reaching the Pole departed on March 1, 1909. The last support party turned back on April 1, 1909, and on the final stage of the journey to the North Pole only five of his men, Matthew Henson, and Eskimos Ootah, Egigingwah, Seegloo and Ooqueah remained. On April 6, Peary established Camp Jessup near the pole. In his diary for April 7, he wrote "The Pole at last!!! The prize of 3 centuries, my dream and ambition for 23 years. Mine at last..."
Peary was promoted to Rear Admiral and given the thanks of Congress by a special act of March 30, 1911. He received honors from numerous scientific societies of Europe and America for his Arctic explorations and discoveries. 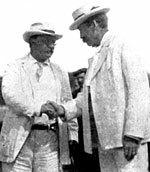 In later years Peary relived the adventure in his writings and speeches, defending himself against his critics, including Frederick Cook, whose competing claim to have reached the Pole in 1908 was announced just days before Peary returned in 1909. He was a sought-after speaker and served as guest of honor at a DKE Convention of the time. Peary retired from the Navy in 1911 and he lived his last years with his wife and their two children, Marie and Robert Edwin Peary Jr., in Washington, D.C., summering on his beloved Eagle Island on the Maine coast. Peary never let a few missing toes stop him from exploring—he shuffled his legs on snow shoes so powerfully that on the 1909 polar expedition he started the day breaking trail until the dog sledge teams overtook him. Today Peary would be an athlete competing in "Iron Man" type events. He is remembered as was one of the bravest and most determined men in American history. 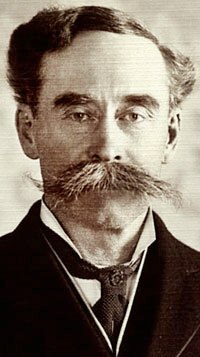 Peary was the author of several books, the most famous being Northward over the Great Ice (1898) and Nearest the Pole (1907). The movie Glory & Honor by Kevin Hooks (2000) chronicles his journey to the pole. In his book Ninety Degrees North, polar historian and author Fergus Fleming describes Peary as "undoubtedly the most driven, possibly the most successful and probably the most unpleasant man in the annals of polar exploration." The Liberty ship SS Robert E. Peary, the destroyer USS Peary, the cargo ship USNS Robert E. Peary, and the Knox-class frigate USS Robert E. Peary were named for him. The Peary-MacMillan Arctic Museum at Bowdoin College is named for Peary and fellow Arctic explorer Donald B. MacMillan. The explorer joined DKE's Mystic Circle on February 20, 1920 and is buried in Section 8 of Arlington National Cemetery. His gravesite is topped by a huge globe on which Peary's personal credo, "I shall find a way or make one," is inscribed. His wife, Josephine, who died in 1955, is buried with him. A lecture poster, promoting an appearance of the great explorer. Peary's achievement has been called "The crown jewel of 19th century exploration." From www.pearyhenson.org; a free public service provided by Bradley Robinson.